Rent was a soundtrack that defined my generation. If you were in musical theatre in high school in the late 1990s, its popular song "Living in America" was your mantra. A string of my memories one summer involves sitting on top of a friend's car outside her parents house, blasting the Rent soundtrack and singing along at dusk. In a fit of nostalgia, I decided to put the Rent CDs in my car for the long commute to work, and listening to it reminded me of this time of my life, in the fond memory kind of way. One of the most popular songs, "Seasons of Love," asks the poignant question, "How do you measure a year?" Maybe because it's still resolution-season and I'm lowering my feet to the ground after hovering around during the holidays, or because I'm feeling hopeful, or because I nearly forgot the two year anniversary of this blog that occurred in January, but something about me was filled with pure nostalgia for the past, and full of questions for the present. After all, how do you measure a year? If you're abiding by the laws of Rent, it's in laughter, cups of coffee, and sunsets. Another good reminder, then, that there's really no day but today, and to at least live in the present as much as one can. As for poetry, music is a version of it, so a few lyrics will suffice for today. Cheers to the 525,600 minutes we have to laugh, love, live, and eat this year. 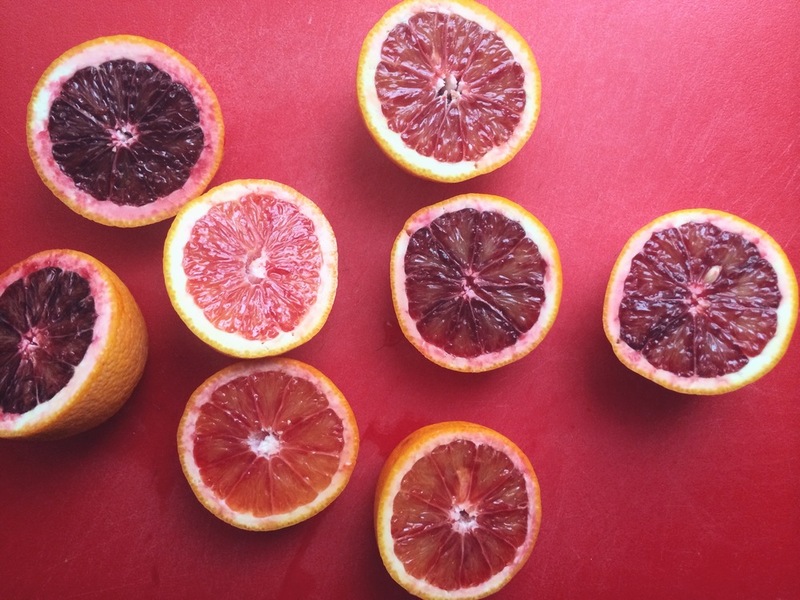 I look forward to blood oranges every winter. They're my favorite part of citrus season, and this year I've been using them every week. I made granita, salad dressing, and now cake with them. I call this a tea cake because it's the perfect afternoon snack that would do well with a smear of honey or butter (or both!) alongside a warm mug of tea. I love it right out of the oven. While it's still warm, the cake will be tender with a slightly crunchy golden crust. Rachel's measurements were in milliliters, and since she used a cup that's the equivalent of a 1/2 cup measure U.S., so I've adapted her measurements accordingly. Preheat oven to 350 degrees. Whisk the flour, sugar, and baking powder, then pour in the oil, yogurt, and crack in the eggs. Whisk until well combined. Add the zest and blood orange juice and whisk again until well incorporated. Pour into a greased baking dish and bake for 50 minutes to 1 hour, or until a toothpick comes out clean.